Do you have fond memories of wandering through the forest as a child? Can you still smell the potent pine and hear the beautiful bird songs? These moments are marked with peace, and that’s not a coincidence. You encountered Shinrin-yoku, a practice that was first studied in the 1980s and utilized in ancient Japan. What’s more, one of the reasons forest bathing is a wonderful experience is the presence of terpenes in the air. Trees and plants throughout the forest emit terpenes, which we inhale as we spend time wandering through the area. If you’re looking for a way to naturally calm yourself, a forest bath may be the answer. Not only will you enjoy the great outdoors, but you will also encounter natural terpenes, which have specific effects of their own on your body. 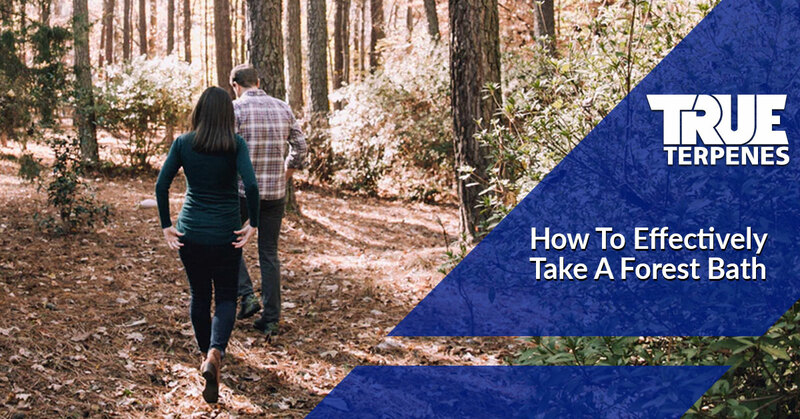 In this article, True Terpenes is going to share how you can integrate Shinrin-yoku into your life, as well as a basic guide on how to effectively practice forest bathing. A big reason why people fail is they don’t prioritize their actions and schedule the task. Start by looking at your weekly calendar. Find a 60-minute gap at least twice per week so that you have time for travel and your forest bath. You’ll start out with two 30-minute sessions per week and gradually increase this as you begin to experience the wonderful effects. Fulfill your promise to yourself and go practice Shinrin-yoku when you scheduled it. A constant drain on our psyche is the unfulfilled promises we make to ourselves. When you set the schedule, keep it. Granted, it may be difficult at first, but as you keep your promises to yourself, it will get easier. Life is hustling and bustling around you all the time. When you trek your way into a forest, your modern life may not be around physically, but it’s still in your mind. A forest bath is meant to offer you some peace. You will need to commit to the practice to get the most out of it. This means that you need to remove yourself as much as possible for your modern life so that you can immerse your mind and senses in the experience. Don’t go another day without finding peace in your life. Want to experience a forest bath at home? You can purchase our terpenes for sale online now! Find the Limonene or the Alpha Pinene that’s going to impact your life. Shop now!